woo hoo, we're in Pet Age this month. Thanks very much to this great trade mag for featuring our botanically supercharged treats. Hope it brings in lots of leads. Thanks Modern Dog Mag for including us in your Budget Buys-Summer Issue product spotlight. We appreciate it! Thanks to spotabusiness for including us in their April businesses of the month! Hey it's May. We're getting some much needed rain here in Sonoma. We're excited about a couple of new distribution opps we're working on. Growing we are. 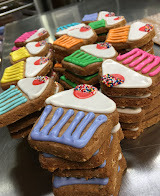 Look for us in AZ and eastern PA.
We'd like to thank Bark magazine for the sweet coverage of our bake-at-home cake and biscuit mixes in the recent issue. 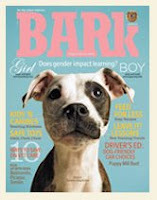 We love Bark magazine.